As of June 11, 2018, postpartum home visits have been offered only to families screened with risk and/or those that reach out to Wellington-Dufferin-Guelph Public Health (WDGPH) requesting additional support. Discontinuation of the postpartum follow-up to without risk screens removes the ability to rescreen and offer service to those who may have scored without risk as a false negative. Although there is clinical evidence that supports universal postpartum telephone and home visit outreach, discontinuing this practice is required in light of decreasing success in telephone contacts. Additionally, the chronic underfunding of Healthy Babies Healthy Children (HBHC) has required a redistribution of resources in order to achieve requirements/deliverables. As a result of this review, WDGPH discontinued telephone follow-up for without risk families. An alternative medium for the provision of accurate, concise postpartum health information in the form of an educational postpartum app called Understanding Your Newborn (App) is being offered (see Appendix “A”). The launch of the App coincided with the discontinuation of universal telephone follow-up with new parents. The new App is offered universally and, together with the WDGPH Guide for New Parents (print booklet), provides timely information and anticipatory guidance to new parents. 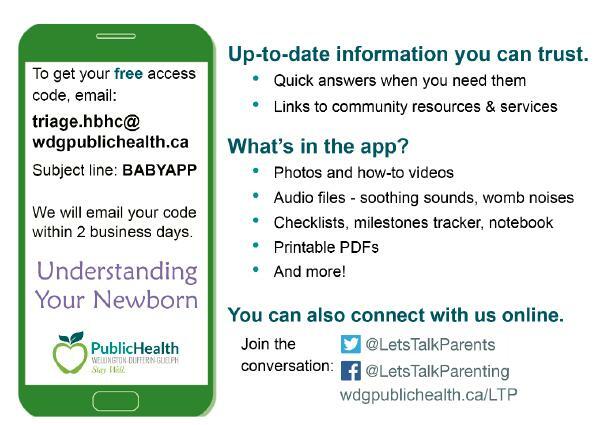 Public health nurses (PHNs) on the Let’s Talk Parenting Line continue to be available weekdays to receive postpartum questions and offer support to new parents/caregivers. The HBHC program provides services and supports to eligible families during the prenatal period and with children from birth up to their transition to school. The program intends to optimize newborn and child healthy growth and development and reduce health inequities for families receiving services. Program components include service and system integration, access to information and resources, early identification and intervention, screening, assessment, blended home visiting services, service coordination, and referrals to community services. provision of postpartum health education in written form for all families, including those without risk. Universal postpartum screening is currently completed by hospital and midwife partners using the HBHC screen to determine risk and eligibility for service. The HBHC screen consists of 36 items that contribute to risk for pregnancy and birth outcomes as well as poor parenting and developmental outcomes. Approximately 50% of the screens score with risk, locally and provincially. Families deemed with risk on the HBHC screen continue to be eligible for follow-up by phone and are offered a postpartum home visit. A family is determined to be with risk if the HBHC screen (confirmed by an assessment and nursing judgment) identifies that there is a serious likelihood that a child may not reach his or her developmental potential and the family may benefit from more intensive HBHC program services. In effect, the 2012 HBHC Protocol discontinued the mandate for postpartum follow-up phone call and visit for the without risk population. As with many other health units, WDGPH’s HBHC attempted to maintain the universal telephone follow-up to all postpartum families regardless of risk in order to provide a brief telephone maternal and infant assessment and referral to appropriate follow-up with primary care, breastfeeding clinics and other postpartum resources. The decision to continue without risk outreach when the Ministry of Children and Youth Services (MCYS) requirement changed in 2012 was informed by a literature review and local program monitoring data. WDGPH conducted a literature review in 2013 examining the clinical value of this practice which provided overall support for universal postpartum follow-up.1 Updated literature reveals contradictory and inconclusive evidence to support this practice.2 Systematic reviews have found postpartum nurse visiting led to increased mother-child interactions, increased maternal confidence, breastfeeding continuance, helped prevent or improve postpartum depression, decreased smoking rates, slightly improved cognitive development among babies, improved the safety of the home environment, and resulted in greater uptake of other medical and educational interventions.3 Other studies have found that positive effects occur more frequently when mothers are considered high-risk based on screening questions, age, low levels of education, income or family support.3 When home visits are provided to everyone, regardless of risk, positive effects become muted, calling into question the universal approach when resources are limited. Provincially, there are concerns about the HBHC screening quality, particularly the false negative rate. Locally, WDGPH has a rescreen rate of 15-20% where there was the identification of an additional 5-7% of families as being at risk using the same tool and therefore eligible for services. Unfortunately, the success rate at contacting families by telephone has been decreasing over the last few years. Data for 2017 is displayed in Table 1: Postpartum Screening and Outcomes. Unsuccessful contact by phone has been attributed to the WDGPH private caller display name, the decrease in use of landlines, families’ reliance on voicemail to manage time and increasing use of cell phones with text-only plans. HBHC Screen 1,252 1,368 52% of all postpartum screens score without risk. Although there is some clinical evidence that supports the value of universal postpartum telephone and home visit outreach, public health is unable to continue this practice in light of decreasing successful contacts. Additionally, the chronic underfunding of HBHC has required a redistribution of resources in order to achieve requirements/deliverables. WDGPH has discontinued telephone follow-up for without risk families and is now offering an alternate medium for the provision of accurate, concise postpartum health information in the form of an educational electronic mobile postpartum app (Understanding Your Newborn). The App launch coincided with the discontinuation of the universal phone follow-up with new parents. As of June 11, 2018, postpartum phone follow-up and home visits have been offered only to families screened with risk and/or those that reach out to WDGPH requesting additional support. As of 2016, more than half of Canadians are using apps on their phones. There was 55% growth in mobile app usage for health information in Canada in 2016. In 2015, 77% of young Canadian adults used apps on mobile phones for information. Average session length, on a health information app, is five (5) minutes. Younger generations are increasing the use of apps on their phones. App users aged 25 to 34 years accessed mobile apps via smartphone for an average of 85.6 hours per month. The App is designed and hosted by InJoy, a company that has a long tradition of providing evidence-based prenatal and postnatal education materials. They currently host the online prenatal education modules for WDGPH. The App has been customized to reflect Canadian standards and local resources available in the community, as well as WDGPH key messages and branding. The App can be viewed on cellphones, tablets or computers. 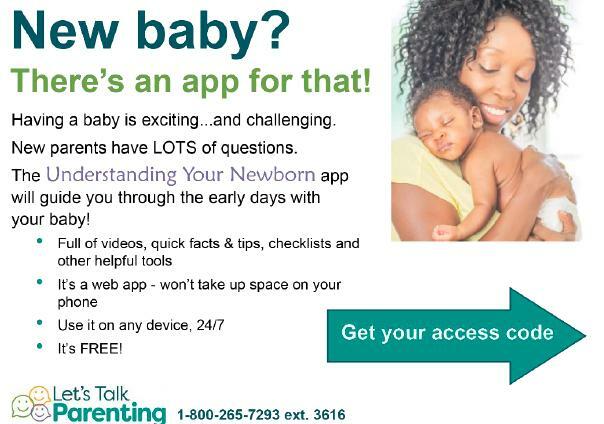 The App contains key content in easy to use formats including videos, photos, brief topics with key messages, parent toolkits and checklists, and making real-time information readily available to busy, sleep-deprived parents, 24/7. The new App will be offered universally and, together with the WDGPH Guide for New Parents (print booklet), will provide timely information and anticipatory guidance to new parents. In addition, PHNs on the Let’s Talk Parenting Line will continue to be available weekdays to receive questions and offer support to parents/caregivers. Although public health has been offering the online prenatal course for seven years, this is the first time WDGPH has explored the use of an app for e-health education. A process evaluation is underway. This will include analytics generated through the App. As well, an e-survey will be sent to parents/caregivers and will measure satisfaction with the learning modality as well as self-reported changes in attitude, knowledge and skills re: transition to early parenting. The App evaluation is expected to be concluded within 12 months of the app launch, with preliminary data analysis at the six-month interval. The App was purchased for $2,750 with an additional cost of $3,000 for a year’s supply of access codes. Access codes are approximately $3.00 each which represents less than the unit cost for a print copy of the WDGPH HBHC Guide for New Parents. The potential risks of delivering health information via an app relate to privacy and potential misinterpretation of content with impact on health outcomes. Privacy issues could arise related to the collection and use of personal and personal health information and related storage, retrieval and security issues. There are a number of factors and actions which mitigate this risk. The App has been designed so that no personal or personal health information is collected by WDGPH in the delivery of this service. The App is web based, which means that no information is downloaded to the user’s device. When an individual requests a code to access the App by email, they receive a response providing a link to the App, their personal access code, instructions on how to sign in and how to access IT support, and a privacy notice. Users read and consent to terms and conditions created by InJoy before initiating their access code. Additionally, the welcome email clearly explains that the collection and use of their email address by WDGPH is limited to providing the access code and an email invitation to participate in the electronic evaluation survey of the App. Providing health information in writing to the public comes with the responsibility to thoroughly review and revise content and to accurately direct users to seek appropriate medical advice and assessment. A content disclaimer is provided upon sign in. Additionally, disclaimers are embedded throughout the App directing users to seek additional health information or medical assessment as appropriate. Although there is some clinical evidence that supports the value of universal postpartum telephone and home visit outreach, public health is unable to continue this practice in light of decreasing reach and unsuccessful contacts. The chronic underfunding of HBHC has also required a redistribution of resources in order to achieve other requirements/deliverables. As of mid-June 2018, WDGPH discontinued telephone follow-up for without risk families and began offering an alternate medium for the provision of accurate, concise postpartum health information in the form of an educational electronic mobile postpartum app. The launch of the App will coincide with the discontinuation of our universal phone follow-up with new parents following receipt of the HBHC screen by hospitals and midwives. The App is available universally to all families in the postpartum period. Users are directed to call Let’s Talk Parenting line to speak to a PHN if they require further information or assistance. Yonemoto N, Dowswell T, Nagai S, Mori R. Schedule for home visits in the early postpartum period (Review). Copyright 2013. The Cochrane Collaboration. Published by John Wiley & Sons, LTD.
ProvincialCouncil for Maternal and Child Health. (2017). Standards of Postnatal Care for Mothers and Newborns in Ontario: Birth to One-week Postnatal Period. Toronto, ON: Canada. Wendy Glauser, Michael Nolan & Jeremy Petch. Should public health nurses visit every family with a new baby? September 15, 2016. Retrieved from http://healthydebate.ca/2016/09/topic/public-health-nurse-home-visits-po…. Mobile App Usage – Statistics and Facts, 2018 retrieved from https://www.statista.com/topics/1002/mobile-app-usage/.